A standard traffic stop about 20 miles south of Maricopa turned into a 200 pound pot bust Sunday evening. Pinal County Deputies pulled over a sedan near I-8 and Vekol Valley around 10 p.m. Sunday night after the vehicle committed a traffic violation. As the vehicle pulled to the side of the road, a male passenger fled the vehicle leaving behind a female driver, identified as 22-year-old Casa Grande resident Linzy Chavez. When the deputy approached the vehicle he could smell marijuana and upon a search of the vehicle discovered seven bundles of pot, according to Sheriff department spokesman Tim Gaffney. Linzy was booked into Pinal County Adult Detention Center for one count each of possession of marijuana, transportation of marijuana for sale, possession marijuana for sale and possession of drug paraphernalia. 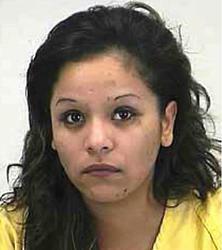 When asked about the fleeing passenger, Chavez said she had no idea what deputies were talking about. The additional suspect was not located.